xPage Beginner : xPages is newly introduced advance web2.0 development technology in traditional Lotus Notes. As we said in the introduction part xPage has advance mobile application development feature through as internet client and Notes client development from notes client. It means the same application you can use on the Internet and in the notes client, no need of redevelopment for notes client. For mobile application, we have extra controls provided by IBM Notes team to standardize xPage application on mobile by making some simple changes. As we know many developers are very enthusiastic to work on xPages with having lot many questions in mind. xPages is nothing but a new design element added in our traditional Lotus Notes. It has the ability to behave like forms, views individually and also it accepts forms and view on the same page, just like the embedded view on the form, it's just a concept, xpage has lot many capabilities for web development. The best part of xpage is the xpage is truly Rapid application development framework. It will easily reduce the coding part due to the addition of inbuilt components. Imagine the days where we do a code for type ahead, date picker, file upload and much more. But now what? Those days are gone now, we do not require such a coding to your notes application. xPage has inbuilt ability / features for your web development. Just the matter is you need to learn how to embed those components on your xpage , but don't worry, you are on the right forum. 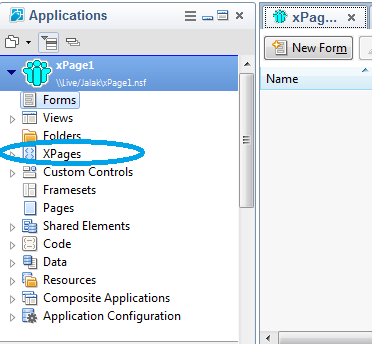 We will explain how to add these components to your xpage development in our future tutorials. Just want to add these lines - best of xPage: Inbuilt features no code required. xPages is a better designed user interface for website developers. xPage comes with many features and hence without worsening our efforts, we will start with one the simple xpage development. So how to start? Yes of course our first "Hello World" program. Many of us started coding with "Hello World" so will do the same practice. Find the screen below, you can see the new xpage design element added along with one more newly introduced design element called as "Custom Controls"
The concept of custom control similar to "Subform" . i.e. 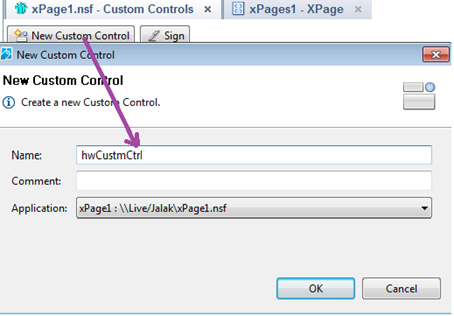 xPages is our Notes Form and "custom control is a "Subform". Click on custom control design element (just below to xpage design element) and add click on “New Custom Control”. Create a new custom control “hwCustmCtrl” as shown in below screen. Open newly created custom control blank page. Insert the Label control on the custom control blank page and insert label text in Label properly as shown in below screen. "Welcome to xPage Hello World"
And save the control and now open our newly created xPage to drag the custom control on xPage from see below.